Created by The Theophany for a collage on a magazine cover. Cool idea, but it basically appears as if someone that doesn’t know much about firearms was let loose in Pimp My Gun. BRB, I’m going to try to convince my girlfriend that regular painted nails are so 2011. There is way to much going on with these nails. Why can’t it just be a simple bolt-action rifle w/ bayonet? 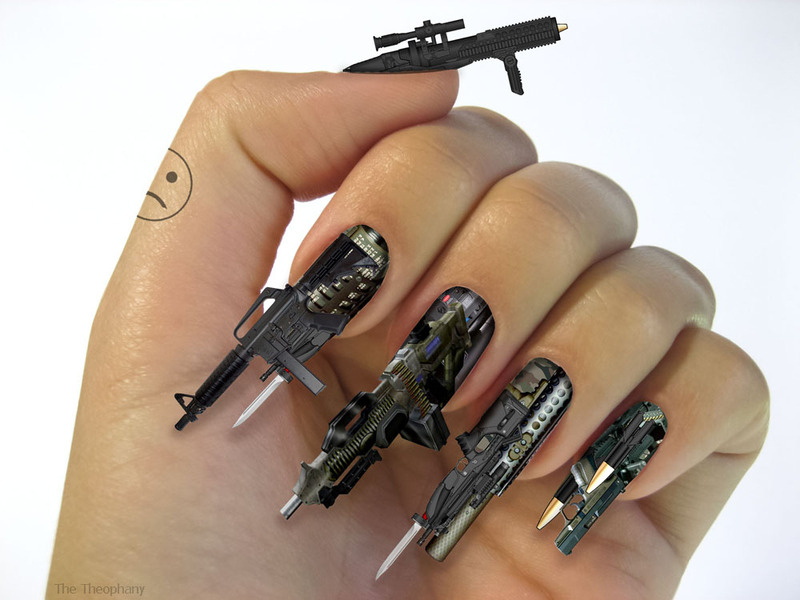 My first thought was “where did she get the cool toy guns?” (to glue on her nails). Seemed like something certain ex-bloggers would do. Then I realized it was a shop job. Long fingernails on girls are gross enough. Let alone when they are fake and ridiculously colored.